NUCON Corporation of Livonia, Michigan, is a specialty fiveaxis manufacturer of turbo machinery components for the aerospace and aircraft industries, industrial compressors and specialty pumps. 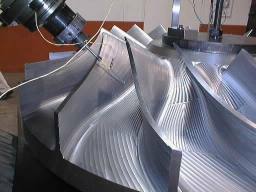 They are one of the unique manufacturers in the world capable of doing very large impellers up to 72 inches in diameter. They've been running OpenCNC on a fiveaxis machine since 1996.